Franklin Clinton during Hood Safari. Franklin Clinton is a 25 year old character in the HD Universe who appears as a protagonist in Grand Theft Auto V. He is a member of The Families. Previously of the Chamberlain Gangster Families set, by 2013 Franklin has branched off with his best friend Lamar Davis into a separate set: Forum Drive Gangsters. He is voiced by Shawn "Solo" Fonteno. Franklin was born in 1988, grew up in the inner city of Los Santos attending Davis High School, and coped with a mother who smoked crack cocaine and later died of a suspected overdose. During his youth, met Lamar Davis and another local boy JB Bradshaw. Franklin and JB started selling cigarettes until Franklin's grandfather caught them and apparent chased them them 'all over South LS'. At the age of fourteen he kissed Tonya Wiggins at a Burger Shot and is arrested for public exposure, blaming racial profiling for his arrest. Franklin, an only child, was spoiled by his grandmother and grandfather until their deaths sometime during his adolescence. He then moves in with his aunt Denise (presumably his grandmother's house left to both of them) and cousin Tavell Clinton and eventually the cousins became members of The Families along with most of their childhood friends. Franklin is later arrested for dealing drugs. Franklin states while hanging out with Lamar that he didn't graduate high-school because he was kicked out for beating up a teacher for unspecified reasons. At one point he began selling drugs for a local dealer named Marcus. Marcus wanted Franklin to do something "above and beyond" however Franklin's refusal ended in bloodshed, with Franklin murdering Marcus and possibly his associates. His only known serious relationship was with Tanisha Jackson, although their relationship began to falter due to Franklin's involvement with gang culture and she finally tried to permanently disconnect herself from Franklin and the Families after she witnessed the death of her own brother in a gang related incident. An incident that Franklin may have also been present for. Tanisha later began dating Jayden, a rich doctor, much to Franklins confusion as he had begun to move away from the gang lifestyle by this point. He and Lamar gained employment at Premium Deluxe Motorsport working for Simeon Yetarian as repossession agents alongside Sacha Yetarian. Despite having a job he does not help Denise with bills and groceries. Franklin and Lamar prove capable repossession agents with Franklin winning an Employee of the Month Award. He even manages to break into the De Santa house, sneaking past Amanda De Santa, Kyle Chavis and Carlos, in order to repossess a BeeJay XL purchased by Jimmy De Santa. His father Michael, however, hides on the back seat and holds Franklin at gun point, forcing him to drive into the company showroom, which results in Franklin and Lamar being fired. Michael, feeling sorry for Franklin, offers to buy him a drink. Franklin and Lamar, without any means of income, kidnap D, a Ballas gang member, in order to demand a ransom although the plan is later abandoned. Lamar, who D had identified, gives his dog Chop to Franklin to look after. The two later team up with recently parolled Harold "Stretch" Joseph and go to a recycling center to purchase drugs. Upon arrival Franklin recognises the dealer, D, although the deal is interupted by the police, which more than likely saved Franklin and Lamar's life as Stretch had planned for the two to be killed off by waiting Ballas gangsters. Franklin decides to take Michael up on his offer of a drink and visits his house. Their conversation, however, is interupted with Jimmy phoning to say that Michael's yacht had been stolen with him in the helm. The two rescue Jimmy but can not recover the boat, with Michael promising to keep Franklin in mind for future "jobs". 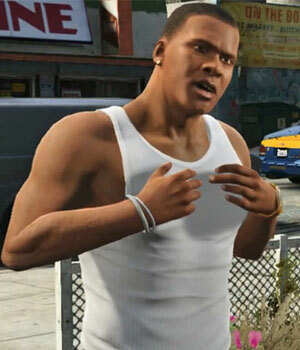 Franklin later helps Michael destroy a stilt house in Vinewood Hills, believing it belonged to Kyle Chavis who Michael had caught cheating with his wife. The actual owner, drug cartel kingpin Martin Madrazo, convincing them to pay for the repairs. The two, needing $2.5 million, meet with Michael's old friend Lester Crest and, with three other accomplices, rob Vangelico's Fine Jewelry in Rockford Hills. While escaping, Franklin is stopped by a man who Michael tells to forget them in a way he had used nine years earlier. This is later reported on the news and is heard by Trevor Philips in Sandy Shores, a small town north of Los Santos. Trevor, believing Michael to be dead, has Wade Hebert ivnestigate before finally confronting him. The three agree to work together to steal an unknown piece of military technology being guarded by Merryweather Security Consulting. The three succeed but are forced to dump their stolen goods. Franklin and Trevor also help Lamar in attempting to purchase more drugs, which again turns into a Ballas ambush although the three manage to escape. Corrupt FIB agents Steve Haines, Dave Norton and Andreas Sanchez, who had forced Michael into doing their work, later bring Franklin and Trevor into their criminal activities. The three are forced to kidnap Ferdinand Kerimov from the IAA building and steal IAA bonds, in an attempt to convince the federal government not to cut FIB funding. Haines later informs Devin Weston, a multi-millionaire businessman and investor, about their abilities and Weston hires them (later deciding against using Michael) and Lamar to steal two exotic sports car, a Z-Type, a JB 700, before delivering them to him. During this time Franklin also begins to work for Lester, performing various assassinations in order to help Lester correct certain wrongs while allowing him to also make a profit by buying certain stocks. With the profits Lester buys Franklin a house in Vinewood Hills and has his things moved to his new house. Franklin's aunt, Denise, then changes the locks of their house and refuses to allow Franklin back in. Agent Haines then informs Franklin, Michael and Trevor that he wants them to perform a terrorist attack on the FIB building, in order for Haines to obtain further funding for the FIB, although they must raise the funding themselves. They then research and rob the Blaine County Savings Bank in Paleto Bay, holding off the local police and military personnel in their escape, while also managing to kill the remaining O'Neil brothers. Franklin, Michael and Trevor then agree to do one final heist but their plans are put on hold when Trevor discovers the truth of what happened nine years prior. Trevor threatens to kill Michael leaving Franklin and Michael, with two other accomplices, to perform the terrorist attack without him after Franklin rescues Michael from the Triads, who had kidnapped him believing he was Trevor's lover. Michael and Trevor's feud continues when they both agree to help Franklin rescue Lamar, who had kidnapped while attempting to buy more drugs at a sawmill in Blaine County, which had been set up by Stretch. Lamar is successfully rescued but Franklin is then asked to kill Trevor by Agents Haines and Norton, thinking Trevor is too unpredictable while Michael at least is sensible, while Devin Weston asks Franklin to Michael. Michael and Trevor, oblivious to the demands put on Franklin, decide to put their differences aside to pull off one last robbery at the Union Depository. Their plan is successful and the group each leave with a substantial pay packet. Franklin is then left with the decision of whether to kill Trevor, kill Michael or save both, which is left to the players choice. If Franklin decides to kill Trevor, he chases Trevor into an oil field and with help from Michael kills Trevor. If Franklin decides to kill Michael, he chases Michael to a factory before pushing Michael over a small barrier half way up a chimney stack with the fall killing Michael. If Franklin decides to save both Michael and Trevor, the three take out a number of FIB agents and Merryweather mercenaries. Michael then kills Stretch, Franklin kills Wei Cheng, and Trevor kills Haines before kidnapping Weston. After driving to a secluded location the three push Devin Weston's car, with Devin in the trunk, into the Pacific Ocean. They then agree to remain friends but end their professional relationships. Franklin's special ability is to slow time down while driving allowing for more accurate cornering and sharp turns. Franklin is the only protagonist to survive all three endings to GTA V.
Franklin is the only protagonist who doesn't kill a character from a previous Grand Theft Auto game. Franklin, if the player chooses to kill either Michael or Trevor, becomes only the second protagonist to kill another protagonist after Trevor Philips who killed Johnny Klebitz. Franklin is in many ways very similar to GTA San Andreas protagonist, Carl Johnson. Both are African-American gang-bangers and in their 20's during the events of their games, both are members of different sections of Grove Street Families and The Families, with The Families based on the former, and they both had lost their mothers. Similar to Luis Fernando Lopez, Franklin never graduated high-school because of a confrontation with a teacher. Franklin states he beat up a teacher, although the reason for this is not stated. Luis Lopez, however, shot and injured a teacher at his school for feeling up his sister. Franklin's license plate is "FC1988", which suggests he was born in 1988. As it appears that Franklin was born in 1988, this is coincidentally the same year Michael De Santa committed his first robbery, taking $10,000 from a small franchise in Carcer City. This was chronologically 4 years before the events of GTA San Andreas and 25 years before the events of GTA V.
Franklin is or may have been religious - he correctly recognizes a Biblical quote from Michael during Marriage Counseling as coming from the Gospel of Matthew. The last four digits of Franklin's FLEECA card are 8673 with the card expiring in April 2016. Poster showing Franklin and Chop. Franklin with Michael and Trevor. This page was last modified on 22 May 2015, at 23:55.